Dennen’s Victorian Farmhouse, on the coast just south of Mendocino, is a beautifully restored Victorian inn immortalized by artist Thomas Kinkade. The inn offers beach access, romantic rooms with beautiful redwood accents and lovely grounds with wildlife, gardens, orchards and ocean views. Situated on two beautiful coastal acres, it is the perfect retreat from the everyday stresses of modern life. A visit to Dennen’s will transport you to a world of luxurious, yet affordable, pleasures: gourmet breakfast served in the privacy of your guest room, feather beds dressed in extraordinary linens and lovely antique furnishings. 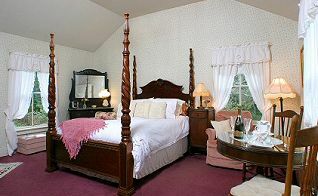 Relaxation and comfort begin when you make your reservation to stay at our Mendocino bed and breakfast. Our goal is to provide an environment that we would want to visit; making your stay here memorable and special is part of that goal. We look forward to sharing the magnificent Mendocino area with you. This and other Mendocino California Bed and Breakfast Inns can be found here online in The Register.